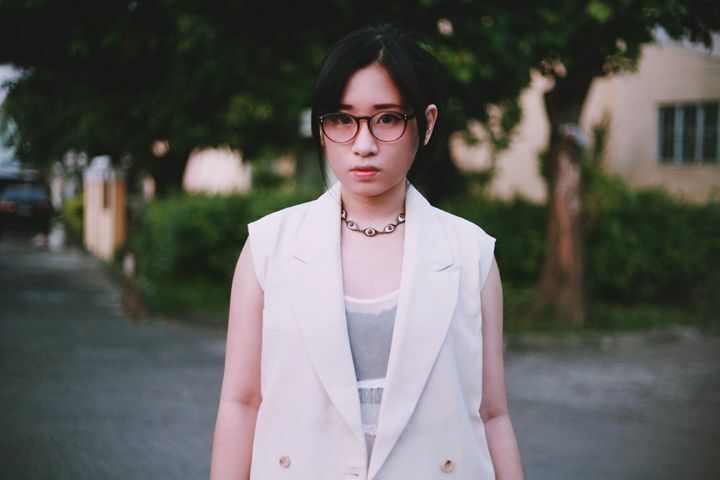 platform sneakers c/o Rainbowholic Shop, angel eye choker c/o ROMWE, Wear Vintage glasses. Tried something a bit different.. 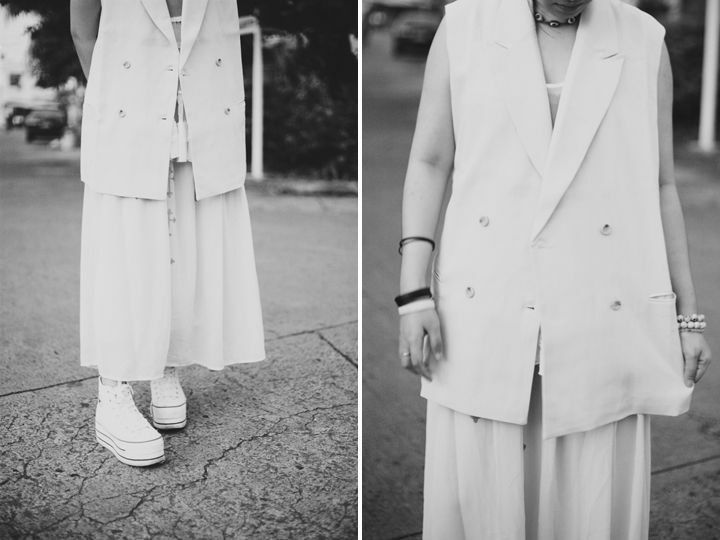 I've always admired people who can wear structured pieces and carry them with such ease. I think it's because I've always opted to hide myself in loose, flowy silhouettes that I've forgotten what it's like to wear something with an actual form. At some point I did try to delve into that by trying blazers, but that didn't work out so well. It seemed a bit too fake and I felt like I was wearing skin that wasn't mine. 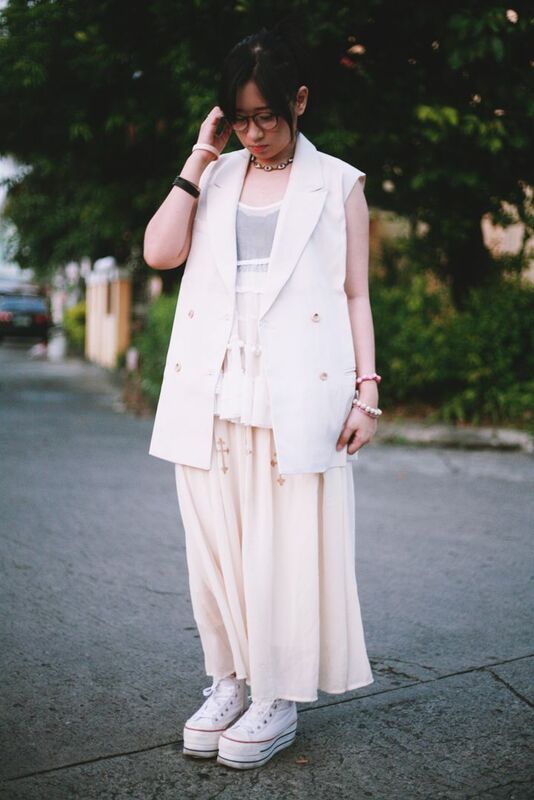 So when I decided to try it again, this time I chose something a bit similar to what I usually go for—an oversized vest. It's tailored, but still gave me that A-line silhouette that I really liked from my mori girl influence. To make it look less pretentious (pretentious in the sense that I'm pretending that I know how to carry tailored things on my shoulders), I threw on things that made it look more laid-back such as a flowy top and skirt and my dirty platform sneakers. Now, I am in no way a 'fashionable' person. As I've said many times before, I like wearing things that I think go together visually. Sometimes it comes off as fashionable, sometimes it just comes off as eclectic (which is, in my opinion, just a fancier word for 'weird'). This outfit, I feel is somewhere between the two, though leaning towards the latter. But I don't really mind, as long as I think it looks nice on me. What do you think?